Come join us under the volcanoes! 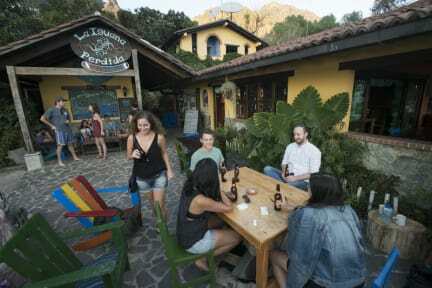 La Iguana Perdida has been an oasis on the shores of Lake Atitlán for over twenty years now offering memories to travellers both young and old while maintaining commitment to community, the environment, and the betterment of our village of Santa Cruz La Laguna. We’re your home away from home whether you come here to learn to dive, hike the trails, study Spanish, experience Mayan culture or simply lie in a hammock with a paperback or enjoy doing nothing at all. Our rooms range from simple to downright luxurious, so whether you’re travelling with your a hand-me-down backpack or a shiny new roley bag we’ve got something for you. We’ve got three dormitories with 22 beds in total, several single/double rooms with shared bath facilities nearby, and ten more modern rooms with private bath. Many of our rooms and common areas have fantastic lake views as we’re located right on the waterfront. Our lakefront restaurant is open from 8AM - 3PM daily offering breakfasts & lunches aimed to satisfy the hungry traveler. Egg dishes, crepes, fruit, sandwiches, salads and our famous licuados are just some of the options you can choose from. We make as much as humanly possible from scratch (from bread, granola to sauces and pastries) and all our fruit and vegetables are locally sourced or grown in our garden. Dinner is served at 7:00 and the fixed menu is a delicious 3-course meal consisting of soup with homemade bread, a main course (vegetarian option always available), and coffee, tea & cake for dessert. Our family-style dinners often lead to hours of storytelling, board games, very bad jokes, guitars & sing-alongs and are often noted as one of the highlights of people's time here. Our famous Saturday costume dress-up party and BBQ is a night you won’t soon forget. We’ll fire up the grill while you rummage through our costume closet. On the buffet you’ll find marinated chicken or veggie burgers and a huge selection of side dishes and salads, followed by our famous chocolate brownies for dessert. The bar is open every day and night for sodas, beer, wine, spirits, home-made liqueurs and specialty cocktails. Sunday through Thursday happy hour runs from 6pm - 7pm and on Fridays and Saturdays 5pm -7pm. Happiness is often permitted outside of happy hour. When the Iguana opened back in 1996, the set up was humble and homey. We had no electricity and no hot water and people actually talked to each other! While we have moved into the 21st century we do try to keep the original spirit of the Iguana alive and that's why we don't offer Wi-Fi. We understand the necessity of communication while you’re on the road so we have a computer room where you can access the internet free of charge, but we like to keep the screens out of the restaurant area to keep the vibe more about great conversations, acoustic guitars and sunsets rather than posting selfies and status updates. Unplug with us. You might just enjoy it! Scuba diving in a volcanic lake! The Iguana has been home to the only dive shop on Lake Atitlán for more than 20 years. ATI Divers offers PADI courses from Open Water on up, the altitude specialty course, and fun dives or refreshers on demand. Lake Atitlan is a collapsed volcanic caldera, so it's something fun and different for those feeling intrepid. Sunken buildings, spectacular volcanic rock formations and hot spots along the fault line are just some of the cool things to experience under the water. There are plenty of other activities to fill your days here including yoga classes, swimming, kayaking, weaving, hiking trails, pool table and dartboard, book exchange and TV room, and visits to local markets and to CECAP, the Santa Cruz vocational center.